Access to the Internet and digital devices is no longer a simple yes/no question. Whether families have consistent, quality connections and the capabilities to make the most of being connected is becoming just as important. For lower-income U.S. families with children in school, being meaningfully connected is especially important to ensuring equal access to learning opportunities. 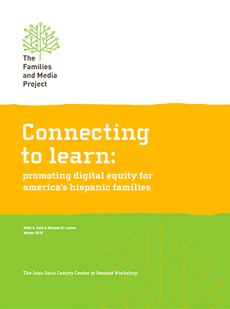 How do families make decisions about connectivity and respond to digital equity challenges? We decided to find out. 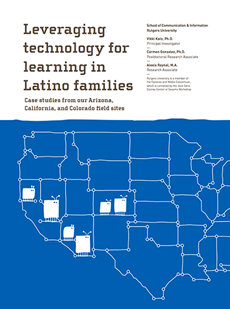 We started by interviewing 336 low-income parents and children in grades K-8 in Arizona, California and Colorado about digital equity issues. 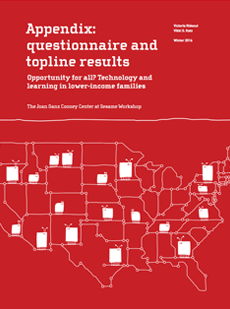 That helped us identify the most important questions for our survey of 1,191 lower-income parents with K-8 children. Read our reports to find out more. Opportunity for All? 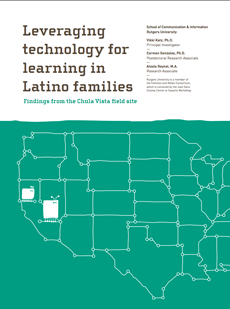 Technology and Learning in Low-Income Families reports findings from our nationally-representative telephone survey of 1,191 parents of children ages 6 to 13 with household incomes that fall below national median. This is the first nationally representative survey on this important U.S. population. SSRS fielded the survey via landline and cell phone in English and Spanish between April 16 and June 29, 2015. The final report was released on February 3, 2016. Almost all lower-income families with school age children are connected to the internet. More than nine in ten (94%) surveyed parents have some kind of Internet connection, including 90% of families living below the federal poverty line. But, more than half are “under connected” in some way. Fifty-two percent of parents with home Internet access say it is too slow, a quarter (26%) say too many people share the same computer, and one-fifth (20%) say their Internet was cut off in the last year due to non-payment. Family members help each other learn about, and through, technology. Three-quarters (77%) of parents help their kids learn to use tech, and half (53%) of kids help their parents to do the same. When parents have less education and/or lower incomes, kids help more. One-third (32%) of parents in the lowest income group (<$25,000) say their child “often” helps them with tech, vs. 15% in the highest income group ($45-65,000). Similarly, 53% of siblings in the lowest income group learn with tech together, compared with 33% of siblings in the highest income group. Mobile-only Internet access has more limited utility for families. Low- and moderate-income parents who only have Internet access via mobile phones are less likely to shop online (36% vs. 66% of those with home access), use online banking or bill-paying (49% vs 74%), apply for jobs or services online (42% vs. 56%), or follow local news online (70% vs. 82%). The same is true for their children, who are significantly less likely to look up information online about things they are interested in (35% vs. 52% with home access), or to use the internet daily (31% to 51%). One-quarter (23%) of surveyed families are mobile-only. Among those families, almost one-third (29%) have hit their data limits in the past year, a quarter (24%) have had their phone service cut off in the past year due to non-payment, and one-fifth (21%) say too many people share the same device for them to have sufficient time with it. Internet connectivity is crucial for children’s learning. Children from low- and moderate-income families with Internet access use it for educational purposes. Among children ages 6 to 13, 81% play educational games and look up information they’re interested in; among kids ages 10 to 13, 81% go online to do homework, 46% to collaborate with other students, and 40% to connect with teachers. Subsidized broadband programs are not reaching their target audiences. Most families who do not have home computers or Internet access cannot afford it. But, discounted Internet programs are reaching very few. Only 6% of parents with incomes below 185% of poverty (a common eligibility level for discounted service) have ever signed up for low-cost Internet access. 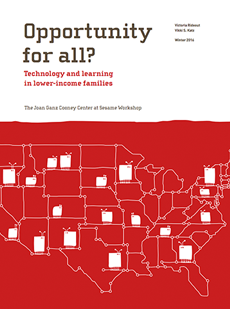 On February 3, 2016, the Joan Ganz Cooney Center and Rutgers University led Digital Equity: Technology and Learning in the Lives of Lower-Income Families, a forum co-hosted by New America in Washington, D.C. The full day’s recording is available on the New America website. Vicky Rideout of VJR Consulting presents results of our national survey of lower-income parents with children ages 6 to 13. Vikki Katz of Rutgers University presents results of open-ended interviews with lower-income parents and their children ages 6 to 13. FCC Chairman Tom Wheeler discussed the implications of the findings for digital equity policy-making, including the FCC's Lifeline Program. Vikki Katz provided closing remarks and an agenda for moving digital equity initiatives forward. Download the podcast Vicky Rideout and Vikki Katz discuss the study on KQED’s The Forum. Use #digitalequity to share your thoughts about these issues on Twitter! With generous funding from the Bill & Melinda Gates Foundation, this project brought together a talented team of researchers to collect and analyze the data, and to write up the findings. You can find out more about us, and our work, below. 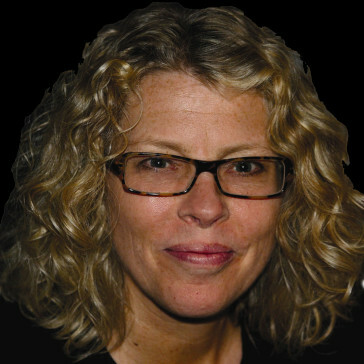 Vikki Katz, Ph.D., is an Associate Professor at the Rutgers School of Communication and Information, and a Senior Research Scientist at the Joan Ganz Cooney Center at Sesame Worshop. As the Principal Investigator for this study, she has led all aspects of the research, analysis, and reports. You can find out more about her work here. Victoria Rideout, M.A., is the president of VJR Consulting, where she conducts research on children and media for academic and non-profit organizations. She directed the national survey research for this project and was the lead author of the survey report. Visit her company website to find out more about her work. 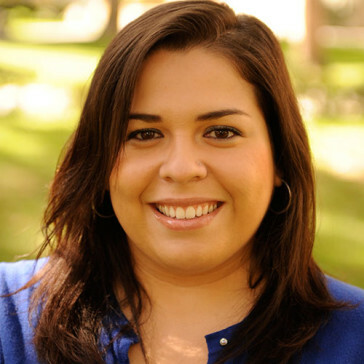 Carmen Gonzalez, Ph.D., is an Assistant Professor of Communication at the University of Washington. 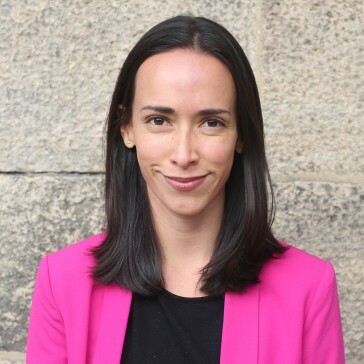 As a Postdoctoral Research Associate, she helped lead both the interview and survey phases of the digital equity study, and co-authored four reports on the interview findings. Find out more about her work here. 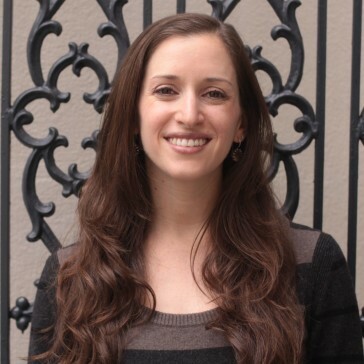 Alexia Raynal, M.A., is a Research Associate at the Rutgers School of Communication and Information, funded by the study grant. She helped conduct interviews, analyze data, and co-authored the four reports on the interview findings for this project. Follow her blog for more on her work and interests. 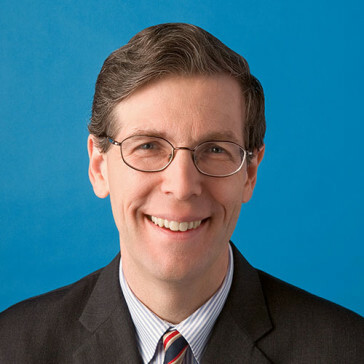 Michael H. Levine, Ph.D., is the Founding Executive Director of the Joan Ganz Cooney Center at Sesame Workshop. The Center conducts research and catalyzes industry and policy reforms to advance high quality media experiences for all children. He leads the research team at the Center that partnered with Vikki Katz to conduct this study. You can find more information about his work here, and about his recent book, Tap Click Read. 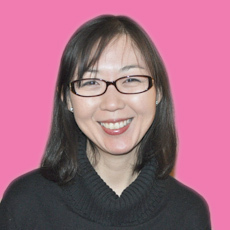 Catherine Jhee, M.A., is the Director of Web and Strategic Communications at the Joan Ganz Cooney Center, where she leads its digital media and publication efforts, including those related to this study. Rocio Almanza-Guillen, Adam Bradbury, Regina Calvario, Yasmin Campos, Jesus Jaime Diaz, Daisy Garcia, Camila Gavin-Bravo, Gerardo Hernandez, Leslie Ann Hill, Scarlett Jimenez, Hillary Kosnac, Yarazel Mejorado, Andres Nuncio-Zuñiga, Andrea Rodriguez, Boanerges Rodriguez, Silvia Rodriguez-Vega, Hugo Salgado, Dinorah Sanchez, Dennise Vega, and Mariana Zamboni. Questions? Comments? Thoughts on what we should focus on next? Send us a note!